This 6-Person Cedar Infrared Sauna has two stagecoach style benches, perfect for relaxing and rejuvenating with family and friends. Exclusive InfraWave FAR heaters emit ultra low levels of EMF, making them safe and beneficial to your health. EZ Touch dual interior and exterior LED control panels allow for easy temperature control. This sauna is available with carbon heaters and comes loaded with tons of extras, including: towel hooks and magazine rack, CD Player with Mp3 plug-in, backrests, 7-color chromotherapy light, and an oxygen ionizer. Constructed from top grade Red Cedar with tongue & groove joinery to create a superior strength edge-to-edge, this sauna is built to last, providing you with years of health benefits and stress relief. Radiant Saunas are the safe, effective and affordable way to relieve stress and improve health, right in the comfort of your own home. Radiant saunas utilize the latest in infrared heat technology and are super easy to assemble. With their Solid Hemlock Wood and tongue & grove buckle construction, these saunas are built to last, providing you with years of health benefits and stress relief. The 1-Person Infrared Sauna is perfect for relaxing and rejuvenating and will fit in virtually any room in the house. The dual interior and exterior LED control panels allow for easy temperature control. This sauna comes equipped with a magazine rack, backrest and a CD Player with mp3 plug-in! 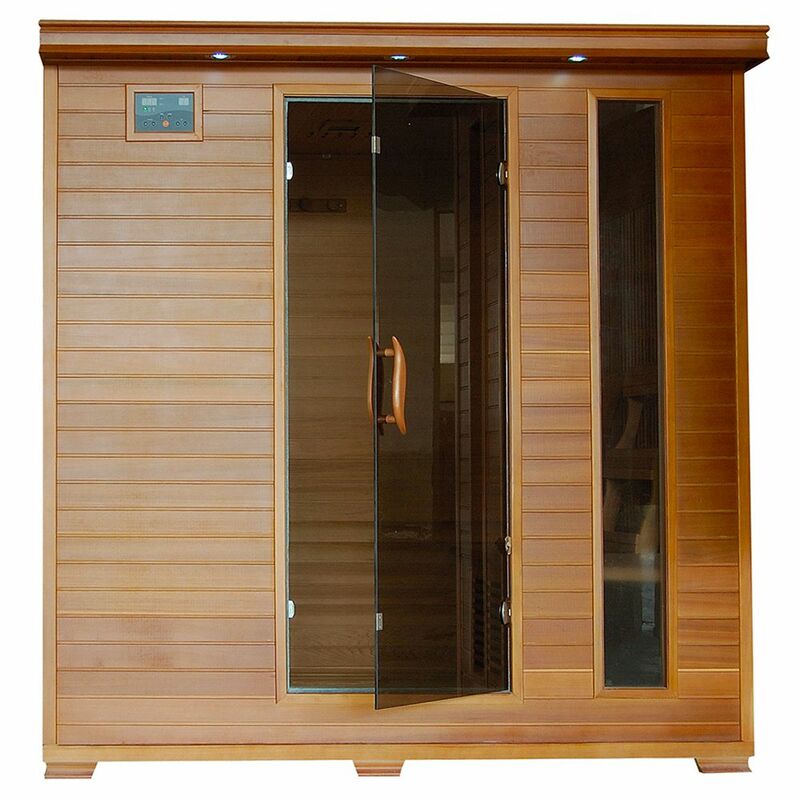 This Sauna operates on a safe 120v/15-amp power and is backed by CETL certification. 5-Year Warranty on wood, structure, heating elements & electrical; 1-Year Warranty on radio. 6-Person Cedar Infrared Sauna with 10 Carbon Heaters This 6-Person Cedar Infrared Sauna has two stagecoach style benches, perfect for relaxing and rejuvenating with family and friends. Exclusive InfraWave FAR heaters emit ultra low levels of EMF, making them safe and beneficial to your health. EZ Touch dual interior and exterior LED control panels allow for easy temperature control. This sauna is available with carbon heaters and comes loaded with tons of extras, including: towel hooks and magazine rack, CD Player with Mp3 plug-in, backrests, 7-color chromotherapy light, and an oxygen ionizer. Constructed from top grade Red Cedar with tongue & groove joinery to create a superior strength edge-to-edge, this sauna is built to last, providing you with years of health benefits and stress relief. 6-Person Cedar Infrared Sauna with 10 Carbon Heaters is rated 5.0 out of 5 by 1. Rated 5 out of 5 by Campcomp from Love it! This sauna is the best! We use it almost daily and already feel better.